March is fatal. Here, it's grey slush, too chilly to wear anything but wintry gear. But jewelry is wearable any time, so it's tempting to pick up a trinket to mitigate the icy blasts. That's not so smart if you're still paying for it by summer. 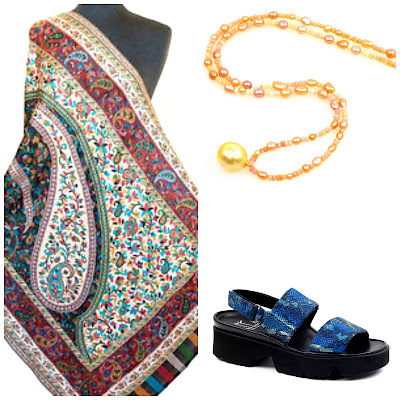 There is a way to have your adornment and bank balance too. Designs of quality, made of noble metals and organic materials are available under $100, thanks to artisans free of the overhead of storefronts. Each would make a pleasing birthday, graduation, Mother's Day or "just because" gift. I admire the shape, grace and texture of ammonite, the fossil of an extinct marine mollusc related to the living Nautilus species. 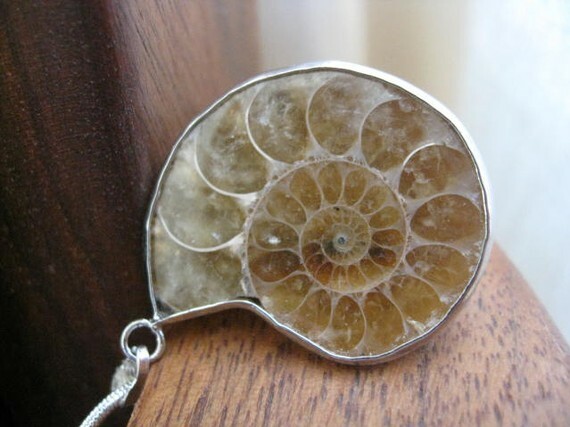 This Ammonite Statement Silver necklace comes with an 18-inch silver chain. 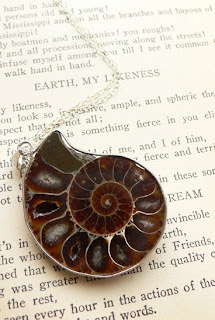 One of a selection of ammonite necklaces from Etsy seller Splurge, $42. Pearl for the price of plastic! 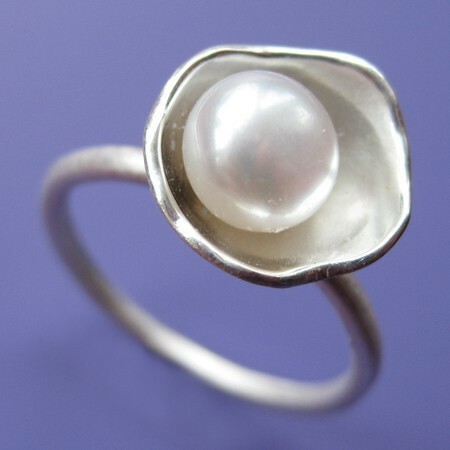 Etsy seller sludlow's Oyster Ring presents a freshwater pearl in a sterling sliver cup; to order in any size. Price, $55. This ring will look even better as the silver oxidizes and wear adds texture. A handmade necklace from Ghana, of glass and carved bone; $38 from Old Beads, item AF476. The necklace is just over 20 inches, the pendant is 1 1/2 inches. Wonderful with a white tee. These vintage fancy glass cabuchon earrings from Etsy seller shipwreckdandy ("Fabulous jewels for peasants") captivate me. Set in oxidized brass, they are just under 1 1/2 inches, and have sparkly silver detail. Price, $22. Here's another natural wonder, an operculum ring. An operculum is a shell element that shows an ethereal, feathery effect. 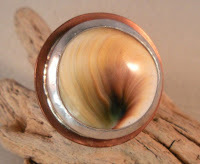 The shell is set with a sterling bezel on copper, with a substantial u-shaped sterling band. Price, $98 from Etsy seller thecuriousbead. 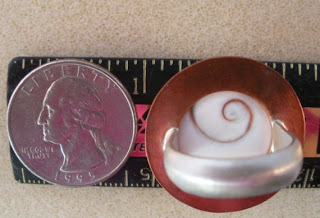 I have to show you the inside of the ring, with its perfect spiral; the dime gives you an idea of the scale of the piece. This turquoise and jet Afghan necklace would add dash to a white shirt (or any shirt); 18 inches long. Price, $28 from Tribal Muse. I'll give fine jewelry it's luxe due another time. If you're shaking our your piggy bank, these gently-priced pieces have grace, character and a tag less than than the tax on a precious choice. Pleasure is not necessarily proportional to price; just keep an eye on workmanship and look for what coordinates with what you have. You'll be well-pleased by your modest treasure, and with the money you save, enjoy an unharried spring. 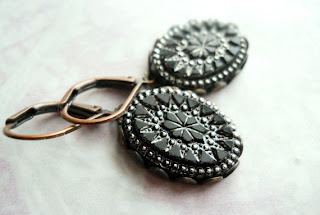 These are so fun, and will look great now and into summer worn with linen and/or bright colors! Love these luxe for less finds! Ah yes, spring. This is the time I seem to shop randomly. The bank account is usually low from paying taxes, but I start craving large ticket items. (At the moment I'm itching to re-do our master bathroom.) These finds are great to satisfy my shopping itches without eating into the renovation account. I have bought almost nothing in the first 3 months of this year - well, almost. I wonder if there is anything that would provide this kind of pickup without a purchase per se. Hmm. Pseu: I see today you are all in black and but imagine LA "springs forth" before long. hostess: I think so too! Really like turquoise and black together. 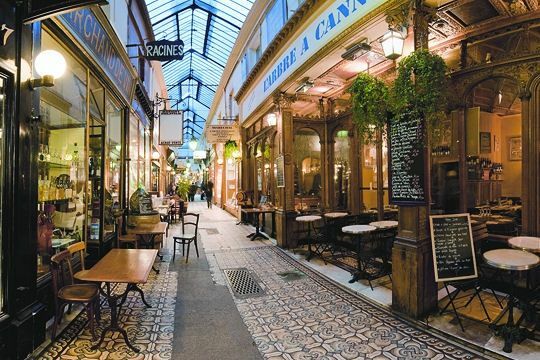 LPC: Another idea: trade a piece or two with family members or a good friend, then you have novelty without any cost. It is still freezing cold here in London as well, no sign of Spring yet and I am still wearing winter sweaters, which is getting a bit boring so I agree that costume jewellery can really make a huge difference and cheer things up. Like your choices. PS. Thanks for the comment on my dress I have kept it. Chicatanyage: I wouldn't term this "costume" as each piece is made from organic material and noble metals. 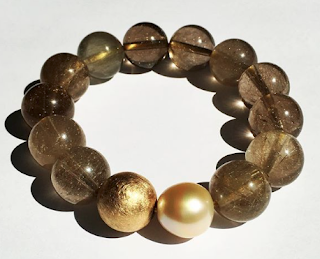 One of my missions is to show that 'real' jewelry is not limited to gold and precious stones, gorgeous though they are. Happy you kept the dress, fab on you! Will you please let your readers know that Beladora.com and Beladora2.com will be donating a portion of all March sales to the Red Cross Japan Earthquake and Pacific Tsunami Relief Fund. We would greatly appreciate your help in getting the word out! 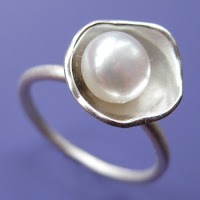 Love the operculum ring -- there was a shop in Newport called "Operculum" when I was a lass -- can't remember what it sold, but the name got added to my "big book of arcane terminology" right quick! Thanks for the visual treats, and for the reminder that I should actually wear the cool silver pendant I bought at the garden show. The pearl ring is simply stunning. And the ammonite is nice as well.